Every once in a while I come across a book that is so delightfully magical I simply cannot wait to share it with my students. This week I have not one, but TWO such delightful books, based on similar ideas. 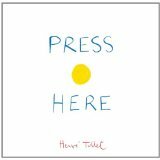 The first is Press Here by Herve Tullet and the second is Tap the Magic Tree by Christie Matheson. As read-alouds, both books offer opportunities for student participation and are excellent resources for making predictions. In Press Here, the author commands the reader to tap on a single yellow dot in the middle of the page. When the page is turned…voila! A second yellow dot has appeared! The book continues in this vein, asking the reader to clap, blow, tip the book this way and that, until it ends where it started with one yellow dot. The first time I read this book was before lunch, and as the children lined up in the hall I head them exclaiming “You could write clap five times and draw five dots!” and “Yeah! And you can tap all the yellow dots and then make them blue!” They were writing their very own versions of the story! What an inspiring book for my young authors! 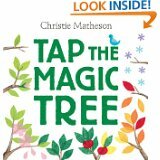 Tap the Magic Tree is essentially the same, except with an additional conceptual focus on the changes that occur across the seasons in one apple tree. This story tied in nicely to our Maple Tree Inquiry and discussions that have already been occurring about the fall changes in our community. Since the children were already thinking of ways to create their own versions of this story we set up a provocation at our classroom writing centre this week. What a busy centre this has been! Along with a copy of the book, our provocation included writing materials, newsprint for book pages, construction paper for a book cover, and a stapler. 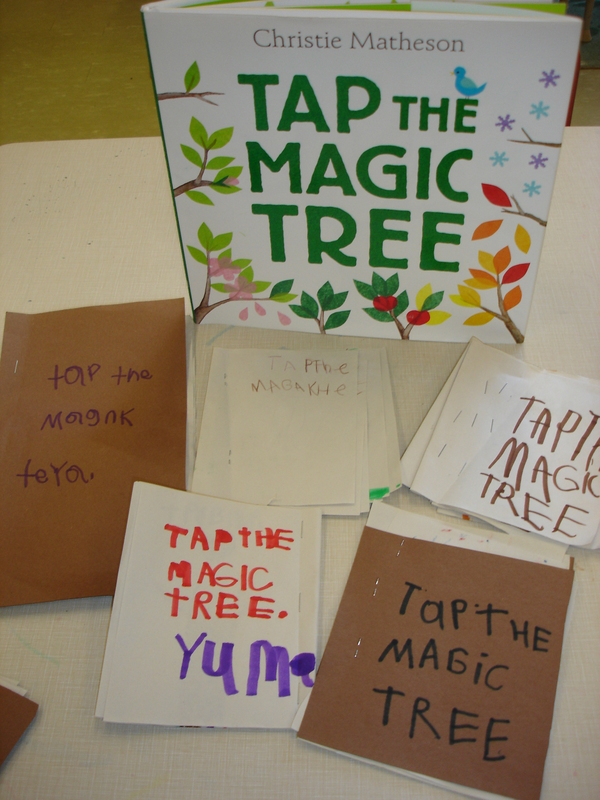 Several versions of Tap the Magic Tree have since appeared in our classroom and the children have been keen to have their classmates’ versions read to them during sharing time. What a wonderful opportunity this has been to create excitement around reading and writing in our classroom! Do you have a book to recommend that helped inspire your young authors? I am always looking for the next great read-aloud! This entry was posted in Writing in Kindergarten and tagged kindergarten literacy, kindergarten writing centre, Press Here, Reggio inspired kindergarten, Tap the MagicTree by msmcdonell. Bookmark the permalink. Hi – One book that Graham and I really enjoy reading is Benny’s Pennies by Pat Brisson. The story stars Benny McBride who starts his day with 5 new pennies and is determined to spend them all. His mother, sister, brother, dog and cat ask him to buy something for them. It is a very sweet book that also introduces the idea of money and the choices one can make when spending it. Thank you for sharing! I will have to look into that book for sure! Maybe one day Graham can bring the book in to school to read during sharing time. I’m sure he would really enjoy presenting it to the class. This year we are flexible with sharing time. If something is so important that the children want to bring it in for a share, then we want to see it! You can send it in any time. Thank you for those suggestions! Those are some personal favorites of mine as well. Do you have any ideas to share on some follow up ideas you’ve done with students? Ok, it is official…I am addicted to your blog!!! We read Not a Stick in the fall with our class. After reading, we placed the book, some paper, various sticks, crayons/fine tip markers and tape at a provocation table. It was amazing what the sticks became. One was a fire pole in a fire hall, another was a slide, etc.